Galaxy distribution and close-ups of some protoclusters revealed by HSC. Higher- and lower-density regions are represented by redder and bluer colors, respectively. In the close-ups, white circles indicate the positions of distant galaxies. The red regions are expected to evolve into galaxy clusters. From the close-ups, we can see various morphologies of the overdense regions: some have another neighboring overdense region, or are elongated like a filament, while there are also isolated overdense regions. 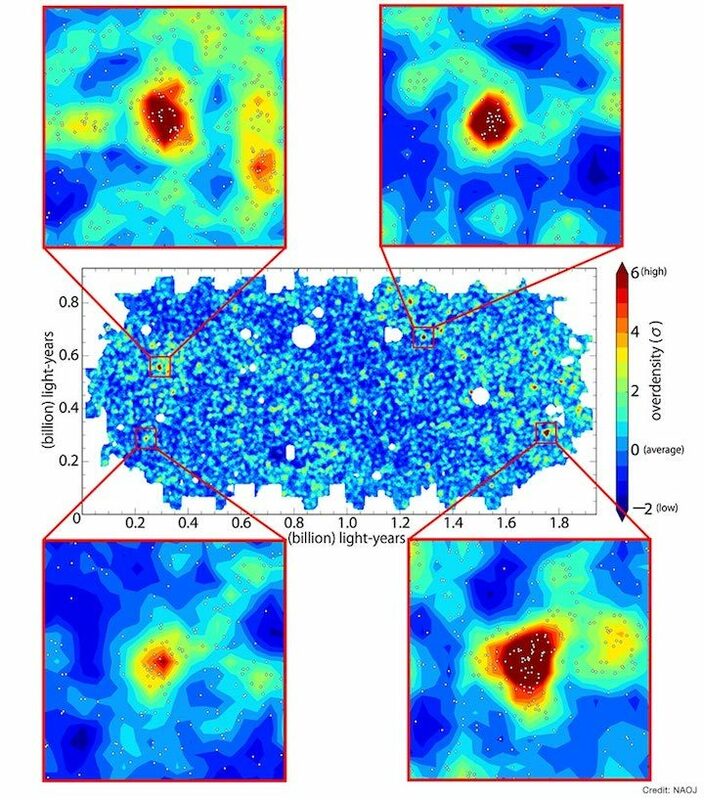 Using Hyper Suprime-Cam (HSC) mounted on the Subaru Telescope, astronomers have identified nearly 200 “protoclusters,” the progenitors of galaxy clusters, in the early Universe, about 12 billion years ago, about ten times more than previously known. They also found that quasars don't tend to reside in protoclusters; but if there is one quasar in a protocluster, there is likely a second nearby. This result raises doubts about the relation between protoclusters and quasars. These results were published in the HSC special issue of the Publications of the Astronomical Society of Japan(Toshikawa et al. 2018, “GOLDRUSH. III. A Systematic Search of Protoclusters at z~4 Based on the >100 deg2 Area”, PASJ, 70, S12; Uchiyama et al. 2018, “Luminous Quasars Do Not Live in the Most Overdense Regions of Galaxies at z~4”, PASJ, 70, S32; Onoue et al. 2018, “Enhancement of Galaxy Overdensity around Quasar Pairs at z<3.6 based on the Hyper Suprime-Cam Subaru Strategic Program Survey”, PASJ, 70, S31).